In order to use intelligent robot to realize industrial automation, it is necessary to study the obstacle avoidance method of intelligent robot in cloud computing environment. The traditional obstacle avoidance method mainly uses fuzzy controller to realize the obstacle avoidance of intelligent robot. The problem of low recognition accuracy exists. In this paper, a design method of laser rangefinder for obstacle avoidance of intelligent robot in cloud computing environment is proposed. Firstly, the location problem of intelligent robot by laser rangefinder is modeled. Then, the obstacles are made feature extraction. Finally, the wavelet neural network classifier is used to identify obstacles. 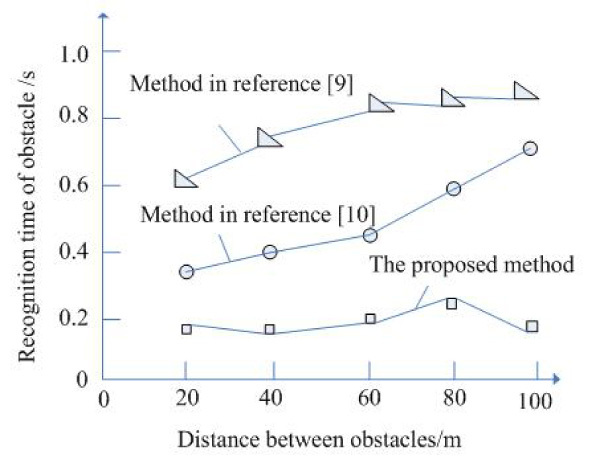 Experimental results show that the proposed method can realize the effective obstacle avoidance of intelligent robot. L. Pan, “Design of Laser Rangefinder for Obstacle Avoidance of Intelligent Robot in Cloud Computing Environment,” J. Adv. Comput. Intell. Intell. Inform., Vol.23, No.2, pp. 334-339, 2019. C.-J. Kim and D. Chwa, “Obstacle Avoidance Method for Wheeled Mobile Robots Using Interval Type-2 Fuzzy Neural Network,” IEEE Trans. on Fuzzy Systems, Vol.23, No.3, pp. 677-687, 2015. H. Kim and M. J. Kim, “Electric Field Control of Bacteria-Powered Microrobots Using a Static Obstacle Avoidance Algorithm,” IEEE Trans. on Robotics, Vol.32, No.1, pp. 125-137, 2016. U. Rosolia, S. D. Bruyne, and A. G. Alleyne, “Autonomous Vehicle Control: A Nonconvex Approach for Obstacle Avoidance,” IEEE Trans. on Control Systems Technology, Vol.25, No.2, pp. 469-484, 2017. G. Yang, Y. Zhang, J. Yang, G. Ji, Z. Dong, S. Wang, C. Feng, and Q. Wang, “Automated classification of brain images using wavelet-energy and biogeography-based optimization,” Multimedia Tools and Applications, Vol.75, No.23, pp. 15601-15617, 2016. M. G. Plessen, D. Bernardini, H. Esen, and A. Bemporad, “Spatial-Based Predictive Control and Geometric Corridor Planning for Adaptive Cruise Control Coupled With Obstacle Avoidance,” IEEE Trans. on Control Systems Technology, Vol.26, No.1, pp. 38-50, 2018. X. Zhang, X. Zhang, Y. Wang, and H. Yu, “Extended social force model-based mean shift for pedestrian tracking under obstacle avoidance,” IET Computer Vision, Vol.11, No.1, pp. 1-9, 2016. J. Dai, L. Yin, B. Yang, and C. Wang, “A Multi-Agent Algorithm of Obstacle Avoidance Based on Vectorial Artificial Potential Field,” Computer Simulation, Vol.32, No.3, pp. 388-392, 2015. X. Yin, Y. Hu, and H. Niu, “Robot in unknown environment obstacle avoidance path planning research,” Science Technology and Engineering, Vol.16, No.33, pp. 221-226, 2016. K. Zhou, “Robot indoor obstacle avoidance algorithm for the fuzzy logic of pheromones,” Bulletin of Science and Technology, Vol.31, No.12, pp. 220-222, 2015. S. Hoshino and K. Uchida, “Interactive Motion Planning for Mobile Robot Navigation in Dynamic Environments,” J. Adv. Comput. Intell. Intell. Inform., Vol.21, No.4, pp. 667-674, 2017.